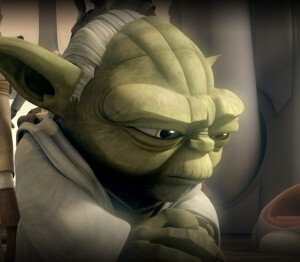 I had expected to have a great deal to say about this, the very final batch of Star Wars: The Clone Wars episodes, particularly when I heard that they would be a Yoda arc that finally revealed how he came to learn how to extend his life after death–to retain his identity and conscious self after becoming one with the Living Force, rather than simply fading away. In other words, the episodes reveal how “Force ghosts” come to be. And although I found them to be a fantastically thrilling and fitting end to this portion of the Star Wars saga, which does an even better job than the brilliant Ahsoka trial arc that would have finished off the series had these unaired episodes never come to light, of creating a smooth transition from The Clone Wars to Episode III, I also don’t find it is as narratively or thematically complex as those Ahsoka episodes. My only qualm with those episodes as an ending was that they were more political than mythic, and while out of all of The Clone Wars‘ many magnificent traits, the one that always stood out most for me was its ability to juxtapose authentic and truly dense political drama with breathtaking, operatic myth, representing the scope of the Star Wars universe arguably more smoothly and full than any other on-screen property in the franchise, I felt that, given the heart of this story is the fall of an ancient order of mystical knights whose failure ultimately spells doom for the galaxy, that it required a final chapter that focused more on the mystical side of the saga. Also, the show’s first episode proper–in airing order–was an episode about Yoda using his powers to defeat an intimidating enemy. It only feels right that it ends on the little green guy, too, revealing some secrets along the way, as well, such as what was up with Sifo-Dyas, the deceased Jedi who had ordered the Kaminoans to begin producing the Clones in the first place, and bringing back Liam Neeson as the voice of Qui-Gon, in a story that references earlier Clone Wars episodes–particularly the ingenious Mortis arc–and foreshadows events from the original trilogy. With all of that said, however, particularly compared to the Mortis arc, the revelations here don’t actually feel that…well…revelatory. They are beautifully produced episodes with absolutely gorgeous imagery, and loads of resonance for the Star Wars arc. When I first heard Qui-Gon’s voice, I squeed. When Yoda landed on Dagobah for the first time and entered the cave for his vision quest, I flailed with joy. The twist that, for the first time that we’ve ever seen, Yoda is the student, is marvelous. I absolutely love that Yoda’s companion for this journey is Artoo, foreshadowing not only Luke’s visits to Dagobah but Yoda and Artoo’s funny relationship at that point in the saga. The cameos in the false reality vision, such as Ahsoka and Qui-Gon. Yoda fighting a dark vision of himself just as Luke would one day fight a dark vision of himself. “There is another Skywalker.” O. M. F. G.* And that final battle, woo boy, what with all of the references to what will happen in the near future in Revenge of the Sith and much later in Return of the Jedi, when that “other Skywalker” will finally inspire his dad to restore balance to the Force, I was one happy camper. On a mythic, sweeping level, these episodes constitute a wonderful, highly charged, dramatic, operatic tribute to the entire Star Wars saga that narratively and thematically bring the Star Wars story right up to the point where it can be picked up in Episode III–I actually can’t imagine what more the writers could have done for a final episode; what with the truth behind Order 66 being taken care of earlier in this batch of “lost” episodes, and the final scene here, in which Yoda reflects both on the potentially inescapable darkness that is coming, as well as the “new hope” that will manifest many years from now, this feels pretty damn complete to the point that I wonder whether this was meant to be the last episode, with perhaps a few other unproduced standalones that were supposed to air before it–but as a story, it all felt inevitable. Nothing about Yoda facing these dark visions–some straight from Palpatine himself–felt entirely unexpected or as completely brand-new as some of The Clone Wars‘ best episodes, which would often either play with and sometimes even subvert our expectations or draw connections between various points in the saga in ways that would enrich both the “present” and the “future”. The Mortis episodes were mindblowing, operating on a dizzying number of levels at once, and managing to both upend everything we thought we know about Star Wars mythology and the Star Wars universe, and reassert it at the same time. These are more straightforward, the foreshadowing more linear, the depiction of Yoda’s journey not drastically different than other stories of its type. There just aren’t that many true surprises. As epic space opera and as a sort of mystical taking-stock of all that came before and the road on which the saga is irrevocably headed, they are a beautiful set of episodes that are more than true to the heart and soul of Star Wars. Although there isn’t as much newness as I might have hoped for, this is a great arc for Yoda, and one which sets both him and the galaxy on a course that will eventually, many years from now, repair the damage that has been done. These episodes didn’t necessarily have to be revelatory, if one sees their purpose as being to put a nice bow on this series, and one which certainly ends on a more hopeful note than the ingenious but pessimistic Ahsoka arc. It was plugged as “George Lucas’ final statement about…the Force,” and that sort of hype made me hope for more, because I don’t really feel like I know or understand any more about it than I did before I saw it. What’s truly important is watching the great Jedi Master Yoda come to realize there is a great deal about the Force, life, the universe, and everything that he doesn’t know, and learning from his own former student about how to begin to tap into it. Surrendering himself to the wisdom of this former student helps set the stage for his entrusting the restoring of the Jedi Order to a future student, who will be but the first of the “other Skywalkers“. *Speaking of which, I’m guessing that this vision didn’t impart the entire story to Yoda–that this Skywalker will be the son of Anakin and Padme, and that Anakin will go dark, slaughter Jedi children, and so on and so forth–because otherwise Yoda would have known about Anakin’s secret marriage and could have potentially prevented a lot of the events of Episode III. Instead, I believe that all he knows now is that there will be another Skywalker (based on the wording, I wonder even if Padme is already unknowingly pregnant already at this point), and that that Skywalker will be the one who will either help Anakin restore balance to the Force or do it in his stead. This would be particularly interesting, given Yoda had always had his doubts about Anakin being the Chosen One, despite Qui-Gon’s assertions, and this could have come across as confirmation to him at this point that Qui-Gon was close, but not completely right (even though that actually is incorrect; Darth Vader does restore balance to the Force by wiping out both the Jedi and–in Return of the Jedi–the Sith. There is also the possibility that Yoda does learn everything here but also knows that he has to let it all play out in order for events to play out as they should and for the world to be eventually restored, because the world is too far gone, but given that he does seem genuinely in the dark in Episode III until it is too late, I think the former answer is the likelier.